On Saturday, January 12, 2019 we had a delightful workshop given by Dianne Byington. 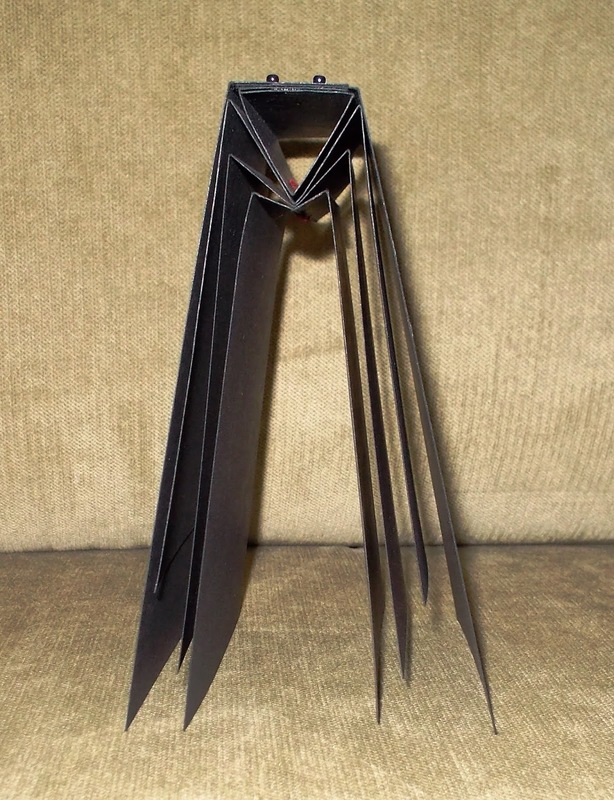 She presented a Hedi Kyle structure from the book, The Art of the Fold. 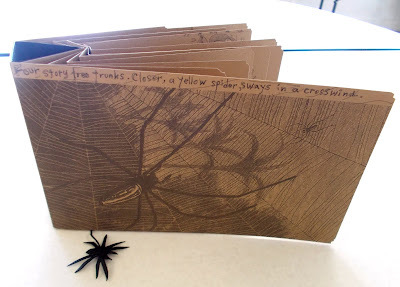 It is a "spider" book. The name is from the fact that when the structure is standing on the fore edge, it looks suspiciously like a spider with the triangular spine as a head and the folded pages looking like segmented legs. Dianne had a sample made in black that had two of the tiniest black, shiny beads attached to the outer portion of the spine looking just like a spider. Just love this sweet little "spider"
Lynne G, our newsletter editor, saw the pictures and brought another sample that was filled with spiders. Needless to say, we were really ready to play with the Hedi Kyle structure. The book is sewn together with a pamphlet stitch and Lynne attached a spider to the thread. Don't get the wrong idea. This was not a Halloween workshop! Dianne gave us a very clear idea of what this could look like and it was not dark and dreary. Instead, the structure calls for color. Just look at the other samples that Dianne brought. Take a close look at these books (click on the picture and it gets bigger). Dianne's samples also have different types of fore edge closures. From a simple cut edge, a folded edge and even (the grey one) a box-like closure. We started with a rectangle of paper, folded it in half and each of those in half again. This is the core of the spine. We will eventually have the two ends overlapping and glued together after the pages have been sewn onto it. Once all of the pages are folded in the center, on successive pages, a second fold will be made to the left and right of the center fold at increasing distances. Each successive page has a deeper fold. The spine will eventually nestle into the deepest V.
Because of the multiple folds on each page, the usual punching cradle doesn't work as well as a simple telephone book. With the smallest fold on the bottom and ending with the opened spine (the order you use to sew the pamphlet stitch), we used a jig to make the stitching holes. We sew the pamphlet stitch from inside of the spine to the center of the pages. When that is complete, the double-sided tape is exposed on the spine and the two flaps are put together. Then on to the covers. Last, but not least is the addition of a cover. The cover comes in two parts. Each part has a section that is the width of the spine base. The back cover is applied first so that the smaller folded portion covers the spine. Then you apply the front cover with the flap covering the back flap. Dianne gave us several techniques about doing things with these books. She also suggested three different fore edge closures. The most simple cut it off, a folded back edge to give more strength and this one where the fore edge is folded the width of the spine. You can see it in the closed position in the first pictures. Many thanks to Dianne. ON TO THE FINISHED BOOKS!